Need a custom solution ? 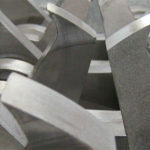 Infeed, discharge, shredding, sorting - we can engineer a solution from concept to commissioning.. 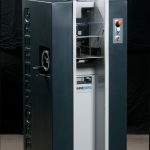 Custom Machines: Built to your requirements. Sometimes a standard, off the shelf solution just doesn’t cut it. 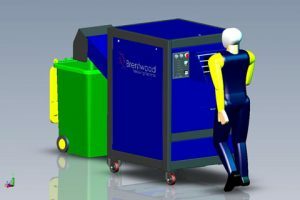 At Brentwood, we understand this and pride ourselves on our ability to customise our equipment to meet our customers exact requirements. 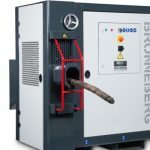 Need a longer shredder – no problems. 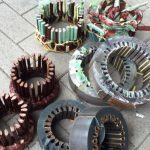 Got a tricky infeed/discharge requirement – we can help. 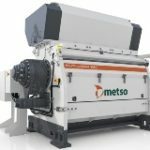 We are an engineering company and can work with you to develop and build plant and equipment using our own machinery – built in our Unanderra factory, or source core technology from our overseas partners to build the plant that you need. 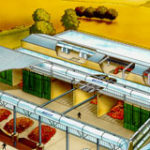 Below are just a few of the projects that we have designed from our customers. Ask us how we can help with your plant requirements. This unit was custom built to wash light plastics and features a full length washer bar with high pressure spray nozzles. 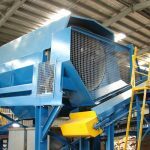 A QS50HD 37kW quad shaft shredder was mounted over an interlocked discharge area suitable for a 6m3 bin. 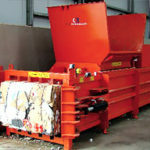 The shredder is fed using a 600mm wide cleated belt conveyor. 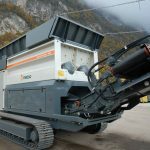 AZ50HD 37kW dual shaft shredder fitted with hydraulic pusher ram hopper. 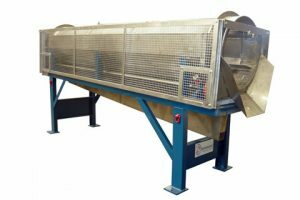 For this plant we used an AZ50HD shredder with 62mm cutters and extended the cutting chamber to allow wide bales of autoclaved medical waste to be accepted into the cutting zone without bunching. A fully interlocked discharge area used sliding gates to access a removable bulka bag stand. 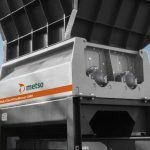 Our QS50HD quad shaft shredder was rail mounted to allow extraction. 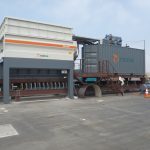 The extraction system was driven by a geared electric motor and controlled from the shredder control panel. 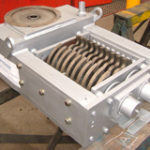 An AZ50HD 37kW dual shaft shredder mounted on a frame with provision for loading using a forklift. 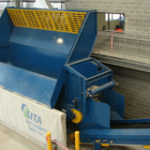 Shredded material is discharged by an inclined belt conveyor into a steel bin. 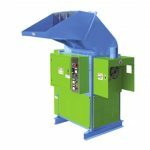 QS50HD waste shredder with discharge to dual compactor bins. 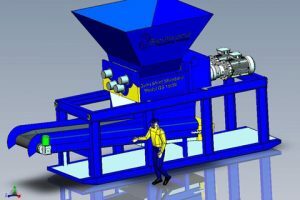 A QS50HD 37kW quad shaft shredder with bin lifter infeed and comveyor discharge to a reversing conveyor setup. 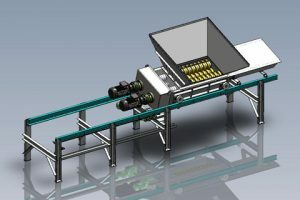 The reversing conveyor feeds dual compactors. 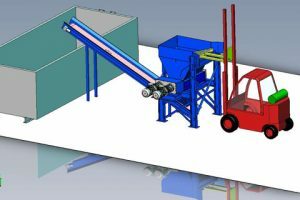 An AZ5 dual shaft 5kW shredder in a fully enclosed setup with a covered discharge conveyor to a wheely bin. This setup was designed to accept hand fed playing cards for secure destruction. 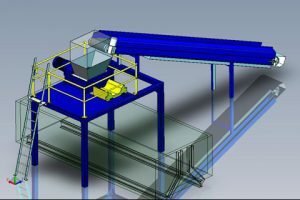 Movable 4 man picking station. 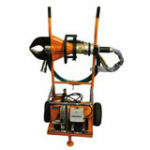 This picking station was designed to be moveable by dragging the unit on its skid base. 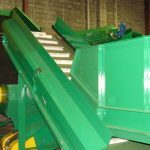 Materials are hand picked from a flat belt conveyor and tossed into chutes that feed 240L wheely bins. 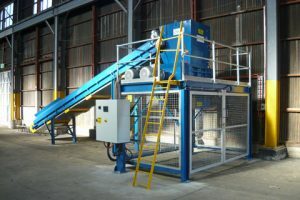 A QS15WL 15kW Quad Shaft Shredder fitted with a removable screen mounted on an elevated frame. 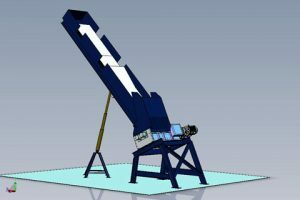 The unit is fed with a 600mm wide inclined belt conveyor. 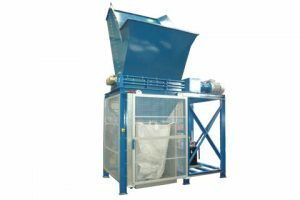 A QS150W 110kW Quad Shaft Shredder with removable screen is mounted on a draggable skid. 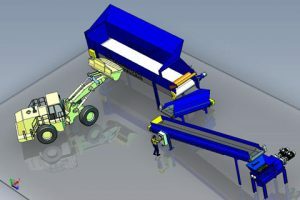 A discharge conveyor takes shredded material from the shredder. 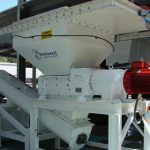 An AZ50HD 37kW dual shaft shredder is fed from a variable speed bulk hooper that meters paper onto an elevated infeed conveyor. 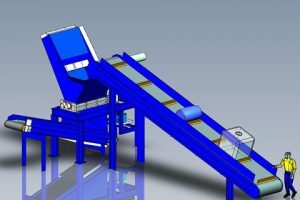 The bulk hopper regulates the flow of materail onto the infeed conveyor to manage loading of the shredder. 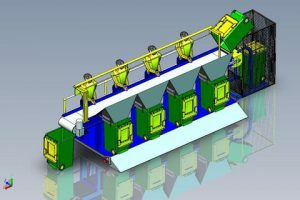 Feedback from the shredder control panel starts and stops the infeed system based on loading of the shredder. 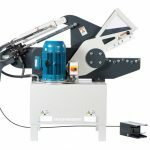 An AZ150W shredder is fed using a hydraulic tilting chute arrangement. 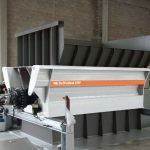 The Tilting shute is loaded with board material (MDF, Chipboard) in a horizontal position using a forklift and then elevated to feed the shredder. 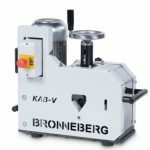 When used with board materials, hydraulic pins regulate the flow of the boards into the shredder. 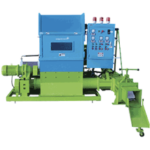 An AZ50HD 37kW Dual Shaft Shredder fitted with a hydraulic pusher ram is fed by an inclined feeder setup. 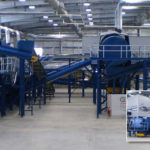 Shredded material is discharged by conveyor to stockpile or inot a bin. 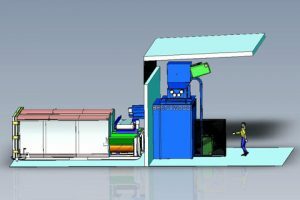 This setup is designed to accept IBC bladders, 200L plastic, and 240L steel drums. 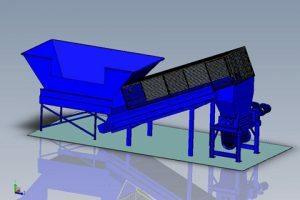 AZ60 Bulk Waste Feeder System. 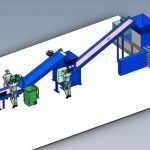 An AZ60 45kW dual shaft shredder is fed waste materials via a feeder system. 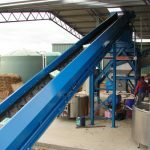 The bulk waste feeder is loaded using a grab or loader and regulates material onto the shredder feed conveyors. Got an idea ? 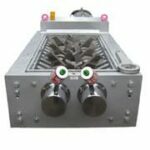 Talk to us today about your custom engineering project. 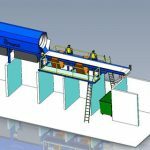 We can work with you from concept to commissioning to develop a solution for your waste processing needs.